We love dogs, just like you. We also love our dogs to travel with us on a regular basis -- and not just to the vet for their annual checkup. Whether it is for a weekend away, a fun camping trip, a drive to go for a walk along a river (did you say WALK? ), or for an adventure hike -- there are many activities that your dog travels with you to do. 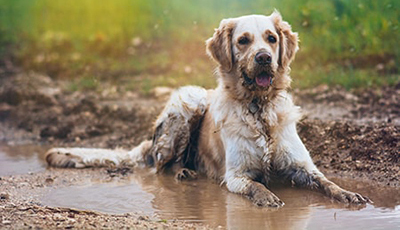 While all these activities are fun for you and your furry friend, they also tend to leave your pup less than clean. That’s half the fun for them! Additionally, travelling with your dog can cause quite a bit of wear and tear on your car or truck upholstery. This can be very problematic long term. Now, you don’t want that to stop you from hopping into your truck or car with your dog and hitting the road, right? That’s where pet seat covers can be a huge life saver. There are tons of different ways of how pet seat covers protect your seats and this article will help by explaining them to you. Let’s not waste any more time and get right to the meat of just how effective these dog car accessories can be. Whether your dog has fur or hair, in most cases they will shed. 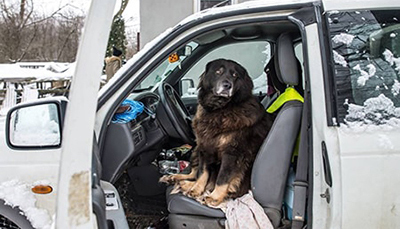 Just because they don’t live in your truck or car, doesn’t mean their fur/hair won’t find a home by nestling itself into the fibres of your vehicle’s interior. If your dog travels with you a lot, this can become a real hairy situation as it is not easily removed once embedded in the upholstery. Beyond that, their hair/fur isn’t necessarily always the cleanest, depending on what your dog’s daily activities are. Even if your dog is the cleanest, most groomed dog in the world, you’ll likely still find yourself cleaning the back seat from at least some hair or fur. We’re not going to lie and say pet seat covers solve your hairy situation altogether. The truth of the matter is that dog hair comes with the territory of being a dog parent. However, seat covers will definitely make it a whole lot easier to deal with and clean up. Take our CORDURA® Seat Covers for example. This tightly woven fabric makes it extremely difficult for fur/hair to find a home nestled in the canvas. The hair will be easily wiped or vacuumed off the seat without much effort. The same goes for fur of course. Regardless of your dog’s coat, your seats will be protected from shedding and you can maintain the cleanliness of your truck or car’s original upholstery. We know how tough this can be with a four legged family member. While we cannot speak for all dogs, there is a fair amount of pups out there that love the water (sometimes a little too much). 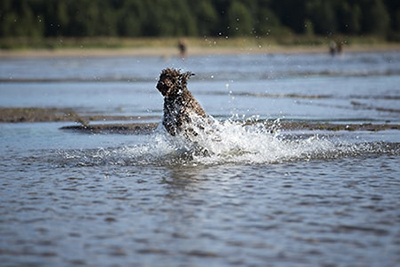 As a dog owner and lover, you don’t want to deprave your four legged swimmer from caching a few waves or splashing it up in the river. That just wouldn’t be right. However, there’s the issue of driving your dog home from their weekly swim meet soaking wet. To avoid this problem, CORDURA® or Atomic Pro-Tect Seat Covers are seat savers when it comes to owning a water dog. These waterproof covers are perfect for your pup after a long ocean swim or paddle down the river. Our Atomic Pro-Tect Seat Covers are made out of a 600 Denier polyester/nylon blend fabric with polyurethane waterproof coating. As for CORDURA®, this canvas based material has waterproof properties all on its own and stands up against wet dogs without any issues. With dog seat covers you can head to the beach or river with your aqua dog and not have to worry about your car or truck interior getting soaked. There’s something about dogs and dirt that go hand-in-hand, or rather paw-in-paw. They seem to find dirt or muddy puddles wherever you go and without hesitation plunk down and start rolling around like they’ve just encountered the single most amazing thing in the world. Others simply just love themselves a really good dig session. As a dog owner, you know what this means: a very dirty, dog. That being said, you might not care for dirt as much as your furry pal does -- especially in your truck. But that’s no longer a deal breaker, as pet seat covers will keep your existing upholstery dirt-free. 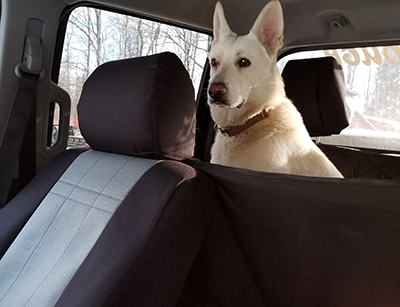 All of our seat covers will protect your truck or car interior from dirt, but if you’re looking for something super easy to wipe down after your dog’s muddy adventures, Protect Vinyl Seat Covers are a solid choice. Just like dog fur, dog seat covers don’t prevent the dirt from happening, but at least now you can enjoy the walk and let them roll around in mud to their heart’s content. Some dogs do great in the car, others not so much. And with those unsettled passengers, comes the potential of doggy drool -- a lot of it. In other cases, your dog might just be a drooler in general. Neither of these situations are your dog’s fault, but they are still problematic. Drool can leave stains and residue all over your seats if you don’t clean it up properly. By installing protective seat covers in your vehicle, you’ll be stopping the drool from ever hitting the original upholstery. 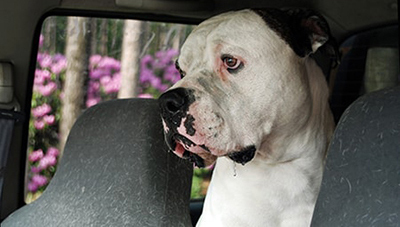 Keep the doggy drool off your seats from the get-go and install seat covers before your dog enters your car. In all instances, our pet seat covers are great for wiping down and spot cleaning so you’ll be able to remove any drool marks as needed. Let the drooling commence! We’ve talked about swimmers, we’ve talked about diggers and now we’ve talked about droolers and how pet seat covers will protect your seats from these types of doggy use. What else comes with all of these types of uses? Eau-de-dog. Not an enjoyable smell, for you or your passengers. 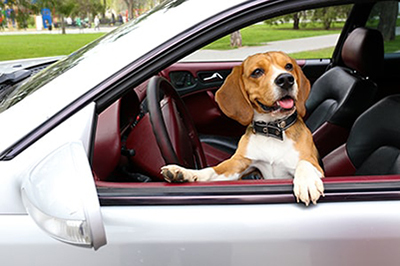 Unfortunately, automakers don’t necessarily consider your dog when designing the interior foy your truck or car. As such, they might choose an original equipment material that is more absorbent than you’d like it to be. Now as a dog parent, this can lead to a smell that is not easily removed without getting it professionally cleaned or spending a lot of time cleaning it yourself. 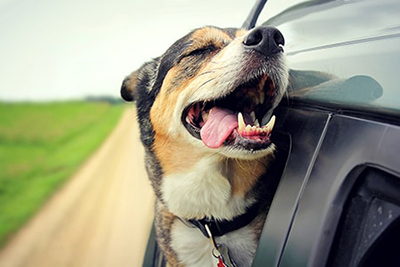 Win order to reduce the smell that comes with a wet or muddy canine, seat covers provide a buffer between the smelly-culprit and your automotive upholstery. Smells won’t absorb as much, thus making any clean up job far more effective in eliminating the eau-de-dog odor. There is another form of digging that does not involve dirt. You may have a dog that loves to dig into his blanket, moving it around just until it is perfectly situated for them to lie down. This habit, while very very cute, can also be their routine in the car which can cause havoc on your seats as their claws can tear through your car’s upholstery. Yet, another thing that automakers don’t keep in mind, right? When your big dog starts clawing at your upholstery, they can do some serious damage, tearing through, leaving flaps of upholstery loose and foam exposed. For some dogs, when they see something like foam, it is like Christmas where they get to unwrap their present; resulting in what might look like a disaster scene, foam everywhere. 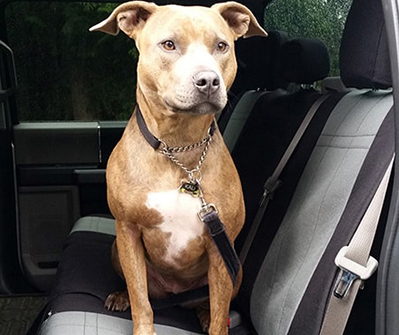 To avoid that nightmarish scene, dog seat covers, like our Atomic Pro-Text or CORDURA® seat covers, are essential to protecting your seats from your pup paws and claws. Not all dogs are chewers, but for the owners that have one, you know how important it is to never leave anything of value out with your dog unattended. The same can be said when you leave your dog in the car (never when it is hot) unattended to run a quick errand. Original upholstery might be able to stand up against regular use but your dog’s teeth do not not fall into this sort of usage. Luckily, there’s still hope. Protective dog seat covers made of CORDURA® or Atomic Pro-Tect are abrasion resistant. The heavy duty material will make it extremely difficult for your dog to chew and tear through. Having these covers on means you don’t have to be as worried when your dog mistakes your armrest or headrest for a chew toy. For this reason, we recommend looking at adding headrests or armrests covers when ordering custom seat covers. We offer these as add-ons in our Just Seat Cover Package. Any additional pieces are included in the Premium Set Package, giving you full coverage and maximum protection. Dogs love their toys and certainly love chomping on their bones. This is a great way to keep them occupied on long trips or when your pup doesn’t travel so well. Depending on the toy, after a good chew session, there may be some mess left behind. When dealing with those delicious dog bones that take hours for most dogs to gnaw through, there’s no doubt going to be some residue left behind. 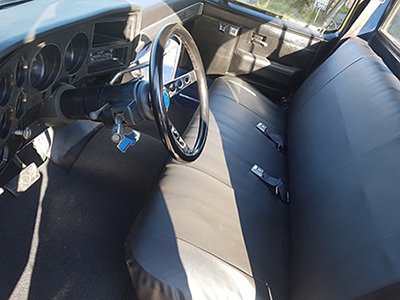 Rather than letting the toy or bone remains (not to mention drool) sit on your truck or car’s interior, you’ll save your seats from the mess with seat covers. Once again, having something to protect the original seats and that is easy to clean is key for these type of doggy scenarios. 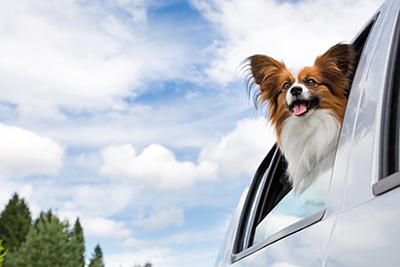 Seat covers will keep your dog happy and your car clean. You’ll be able to let them chomp away without worry! Let us not forget the protection you’ll get from the little accidents that occur. Whether you’re a puppy owner or have an old timer on board, things happen. When we say “accidents”, we think you know what we’re talking about so we won’t get into specifics here. But knowing how pet seat covers protect your seats is worth going into detail about. These types of accidents can destroy an interior for multiple reasons. Some may stain, some may smell, but all of them require a serious clean up. This means more than just a quick pat down with a paper towel and calling it a day. Leaving these types of accidents unattended only results in a harder mess to clean and a very, very stinky car with unappealing upholstery. That being said, accidents are unavoidable and having dog seat covers installed will make a world of a difference. Yes, you will still need to clean up but at least you know that the original upholstery is safe from any moisture, stains or smells. As a preventative measure, if you’re planning on getting a puppy or a new dog and would like them to travel with you, having dog car seat covers installed before the new four legged addition enters the vehicle is ideal. We’ve covered a number of situations of how dog seat covers will protect your seats, but as a dog owner, you know that life can sometimes be unpredictable -- especially when travelling with your canine. By having your seats covers, your truck or car will be protected from everything else that comes with the territory of being a proud dog mom or dog pop. With dog seat covers, you will be prepared for your next camping or road trip, the annual visit to the vet (always fun! ), your puppies first car ride, and many more memorable moments with your four legged family member. We know you love your dog, pet seat covers just make life a whole lot easier!